Experts in the imaging space predict more data, augmented intelligence and other cutting-edge features will become available in the future. Medical imaging technology is a key piece of the healthcare information technology puzzle. And how that fits today is not necessarily how that piece will fit tomorrow. 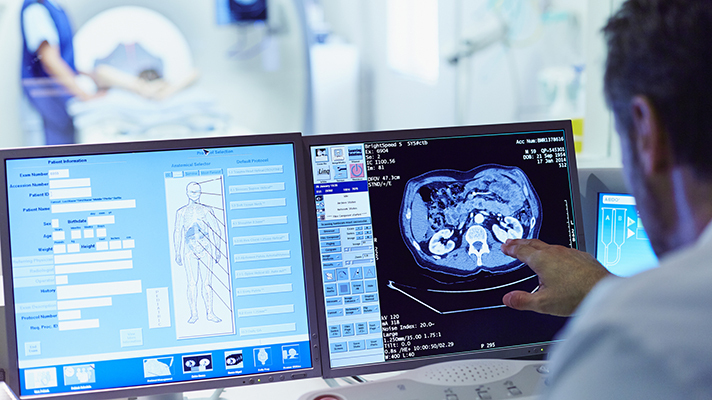 Experts from across the healthcare enterprise imaging spectrum, in fact, have some similar and some different views on where imaging technology is headed. What they agreed on is that emerging technologies such as natural language processing, 3-D, augmented intelligence and algorithms will play a more prominent role moving forward. In the next generation of imaging technology, where there is some adoption now, digital image platforms using image recognition algorithms will start to provide some useful assistance over the current generation of primarily viewers and documentation tools, said Ken Kleinberg, vice president of research at Chilmark Research, a healthcare IT research and consulting firm. “For radiologists tasked with analyzing dozens, hundreds or even thousands of images for each study patient, this would include processing images in greater detail than humans can, helping them identify and more accurately measure the size and volume of areas of interest, making it easier to compare images, helping them draw/annotate on the images and using recorders and speech recognition tuned for capturing dictations,” Kleinberg said. Although these platforms link the study images to the correct patient and may bring in relevant information, it’s primarily the radiologist that establishes the context and uses that information in the analysis, he added. Pathologists would receive similar types of functionality for identifying and analyzing the digital images they work with, he said. "By potentially semi- or fully-automating analysis, [imaging] platforms will make detailed diagnoses for the masses at reasonable costs." In the generation after that, image recognition platforms up their game, said Brian Edwards, associate analyst at Chilmark Research. This can include making the first pass on images to identify areas of interest, categorizing areas of concern, and making it easy for clinicians to annotate into reports via natural language processing that captures meaning not just words, he said. Frank Pecaitis, senior vice president of sales and marketing for North America at imaging vendor AGFA HealthCare, said hospitals are in the midst of a transformative time with enterprise imaging. “The healthcare industry is witnessing digital disruption at every turn, with the introduction of machine learning, artificial intelligence, wearable technology, genomics and similar advanced clinical applications that generate an avalanche of digital information and diagnostic data,” he said. When it comes to medical imaging, Pecaitis pointed to four key areas that need to be considered to improve next-generation technology transformation and enable an “augmented intelligence” strategy: Image acquisition workflow (pre-acquisition, acquisition, prioritization, procedure protocol automation); image analysis and interpretation (post acquisition QA, machine learning-based automated abnormality detection); reporting (automated report templates, structured reporting and voice-to-text synchronization); and communication and collaboration (ability to initiate critical alerts and notifications based on AI and machine learning findings and notify assigned caregivers). The potential benefits of augmented intelligence are realized when it is used in the context of workflows and systems that healthcare practitioners operate and interact with, he explained. Unlike artificial intelligence, which tries to replicate human intelligence, augmented intelligence works with and amplifies human intelligence. Reducing the size of imaging technology is an important goal for imaging vendors across the globe, said Sarah Verna, worldwide marketing manager for global X-ray solutions at Carestream Health, a medical imaging vendor. The company also is investing in creating technologies that reduce the size and weight of portable imaging devices to make it easier to image patients at the bedside. Critical care patients are surrounded by equipment, lines and wires that obstruct imaging. Smaller portable imaging systems that are easier to maneuver allow technologists to achieve better positioning and capture high-quality images of seriously ill or injured patients, she added. And expanding the use of 3-D imaging can deliver an exponential increase in diagnostic information when compared to a traditional 2-D X-ray, said Helen Titus, worldwide marketing director for CT and ultrasound solutions at Carestream Health. "Weight-bearing images allow orthopedic surgeons to see fine details… and surgeons report that CBCT technology delivers better image detail and image quality than traditional CT systems." Carestream Health is exploring the possibility of using CBCT technology to generate 3-D images of other areas of the body, in addition to extremities. And the use of 3-D data for printing anatomical models is in the early stages. These can be used for custom implants or for a surgeon to visualize pathology or an organ prior to surgery. “There is a huge potential for continued growth of 3-D imaging and applications,” Titus said. As vendors roll the raft of cutting-edge technologies into their enterprise imaging products, Chilmark’s Edwards said the tools will better inform clinicians can make about patients. Imaging platforms will attempt to match a current case to other cases – in ever more comprehensive databases – that have shown similar progressions, and this information will be used to make predictions, Edwards added.